A key part of successful sales is the ability to put your finger on the right information at a moment’s notice. Time spent poring over long lists of search results is always better spent focusing on sales. There’s also nothing worse than having to look through page after page of organizations, people and notes when you know you’re looking for a specific time-sensitive deal. So what’s new in Pipedrive search? In an effort to help you stay organized we’ve overhauled the way searches happen inside Pipedrive. You can now narrow your search parameters according to Pipedrive categories before the fact, rather than just getting a mixed list of results and having to sift through them manually. You want to find a specific deal, but it has a somewhat generic name, let’s say Smith. You also have several contacts named Smith, some files with the same name and several Smith organizations. In the past, you would have had to wade through a list featuring all of these. You could say it was like looking for a needle in a Smithstack. 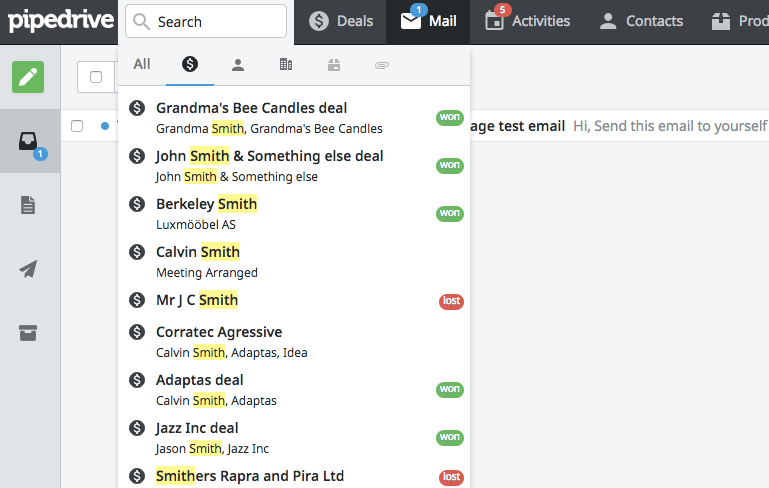 With this upgrade, you can select to search only Deals, People, Organizations, Products or Files. In fact, a smart list drops down even before you click search, so you will often be able to go straight to the result you want, rather than a list of search results. Even if this is not the case and your result is lower down, if you’re searching for a Deal, the search results will only feature Deals. The same obviously goes for People, Organizations and the rest. Of course, when you have only a vague idea what you’re looking for, you may want the full results list. We’ve left the ‘All’ button there for these situations. How do I get the new and improved Pipedrive search? 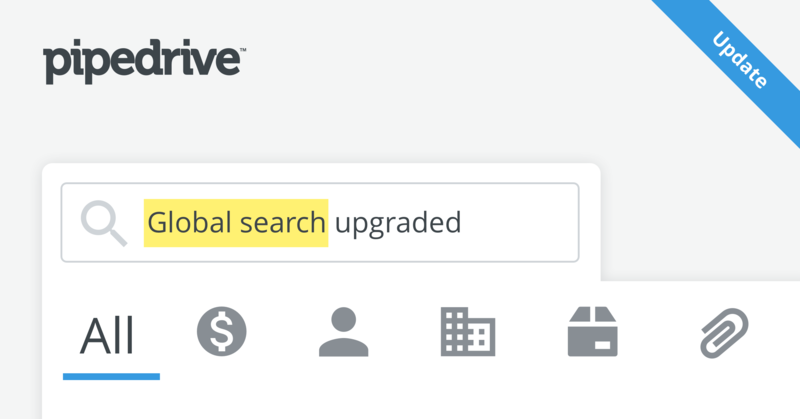 The Pipedrive search upgrades outlined above should be visible in your search bar already, as we are rolling this out to all customers simultaneously. Go ahead and try it for yourself.